During winter Bahrain comes alive. People are outside making the most of the cool weather, especially in places like Bahrain Fort. Which is one of my favourite sunset watching spots. Bahrain Fort is probably one of the most famous tourist sites in Bahrain. It’s a stunning archeological site. One I hope is well maintained for years to come. At sunset you’ll find all sorts of people around the fort. Families with kids. Runners taking their evening run around the fort. Walkers getting their walk on. And people like me who want to watch the sunset. 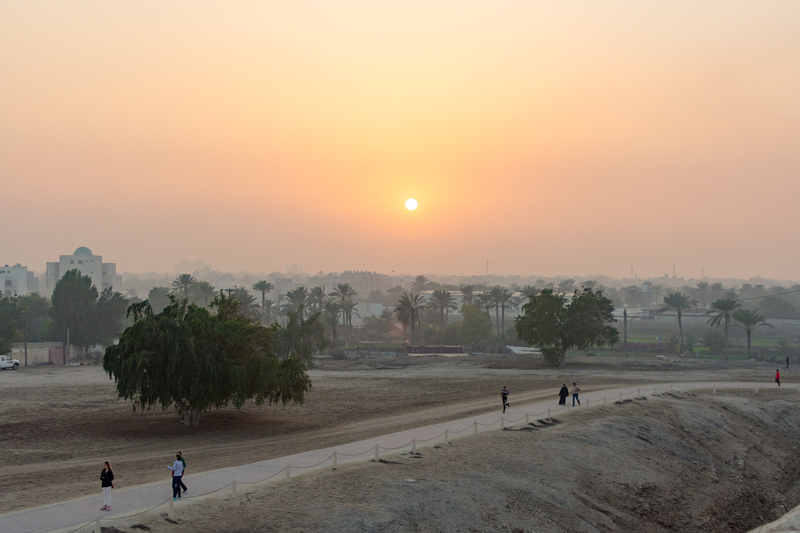 The view from the top of the fort is one of my favourites in Bahrain. It’s not a particularly elevated view. You don’t have to go too high up to get a great view in Bahrain—the island’s so flat! But from the top you get to see the different landscapes of Bahrain. On the one side you’ve got the sea, another is filled with farmlands and date palms, and look another way and you’ve got the high rises in Seef. I haven’t visited the fort in a long time. I should go back before summer sets in. And take more obligatory sunset photos.